In 2016, 900 people died from an opioid overdose in Philadelphia. Twenty percent of those deaths happened in the Northeast. Insert the Narcan distributor into a nostril. Push the middle button up with your thumb. There. You may have just saved somebody’s life. Neighbors from the Northeast and other regions of Philadelphia gathered at CORA Services Conference Center at 8540 Verree Road Wednesday, Nov. 1, to discuss the opioid epidemic, and how to respond to it. It was the first in the organization’s community conversation series meant to provide the community with important and relevant information. 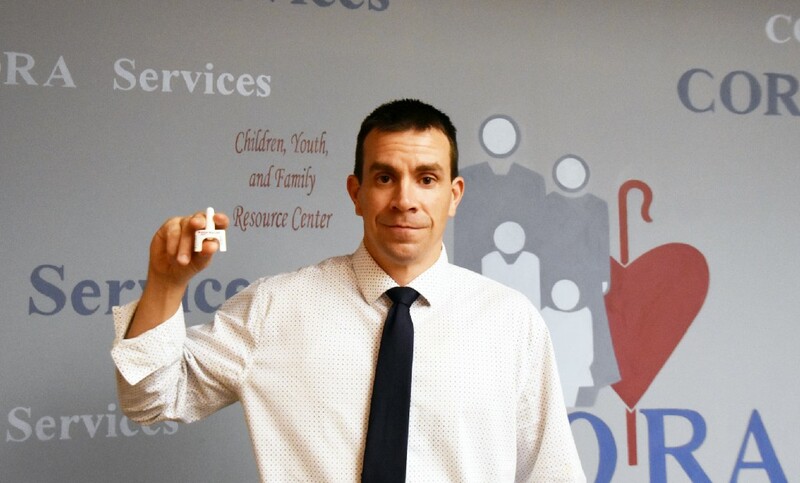 Mary K. Doherty of CORA led the discussion and presented information, while Dr. David Fialko of the Council of Southeast Pennsylvania Inc. offered a demonstration on how to administer Narcan, a medication that can reverse fatal effects of an opioid drug overdose. AnnMarie Schultz, CEO of CORA, began the discussion with some startling facts. In 2015, 600 people died from opioid overdose in Philadelphia. In 2016, that number jumped to 900 people. “Twenty percent of those deaths are happening here in the Northeast,” she said. One of the major points of the discussion was to educate and take care of someone experiencing a drug overdose, which Fialko demonstrated. Narcan comes in a white plastic bottle shaped like a lowercase ‘m’ with a nozzle pointing out of the top middle. Narcan can be picked up at any pharmacy over the counter with no prescription. If the pharmacy does not have any in stock, it should be able to get some within 24 hours. Fialko credited Narcan for saving 485 lives in Bucks County last year. Someone experiencing an overdose may have blue, pale or clammy skin, slow or no pulse, infrequent or no breathing, and may throw up or pass out. If you encounter someone experiencing an overdose, follow the steps of SCARED. 1. Stimulate the person by shaking their shoulders or calling their name. 2. Call 911 if they don’t respond. 3. Airway — check and make sure they are breathing. If they are not, give rescue breaths. 4. Respond by administering the Narcan. Insert the bottle in one nostril and press the button. Each bottle is one use only. 5. Evaluate — if they are still not responding, administer Narcan in the opposite nostril after waiting a few minutes. 6. Do not leave until help has arrived. Lay the person in the rescue position if at all possible. Put them on their side and place both hands beneath their head. If possible, bend the top leg at the knee to help hold them steady. After Fialko’s presentation on Narcan administration, everyone in attendance was able to leave with a certificate showing they had completed training. Doherty led the discussion about the stigma against those trying to receive recovery. She said it’s time that it stops being perceived as a moral disease, and instead as a chronic, physical and mental disease. Overdose statistics from last year show that there was an increase of overdoses in November and December last year, possibly due to the holiday season. Doherty said that those feeling lonely around the holidays could turn to drugs for a quick fix. “They’re looking to fill the hole — and when you take their drugs away, that leaves the hole empty,” she said. Addiction can affect anyone, but people who suffer from overdoses mostly fall in the 35- to 59-year-old age demographic. White people are most at risk, and those who die are overwhelmingly male. Opioids were found in more than 80 percent of overdose deaths in Philadelphia last year. Opioids are broken into three categories: natural, which includes opium, morphine and codeine; semi-synthetic, which includes heroin, hydrocodone (Vicodin) and oxycodone (OxyContin, Percocet); and fully synthetic, which includes fentanyl and its many varieties. Mixing fentanyl with other substances caused a huge spike of overdose deaths in 2006. Fentanyl is 50 to 100 times stronger than morphine. Carfentanil is an even stronger version of fentanyl that is 10,000 times stronger than morphine, and one of the most potent drugs used commercially. Other points discussed include providing those in recovery with more options. There are protective factors that lower the risk of becoming addicted, including family and social connections, emotional health and feelings of control. Doherty also said that the discussion around providing safe injection centers has been in the works for a long time, but is gradually picking up steam. There was a bright spot in the discussion: teens’ use of drugs, alcohol and tobacco has decreased significantly in 2016, reaching the lowest rates since the 1990s. Neighbors speculated this was due to an increase of access to information, and parents being better informed as well, among other reasons. The Northeast Times is interested in talking to Northeast residents who have been impacted by the opioid epidemic. Please reach out to lkrum@newspapermediagroup.com if you would like to tell your story. You may remain anonymous.